How to implement Chain Of Responsibility Design Pattern in Java using simple example ?. 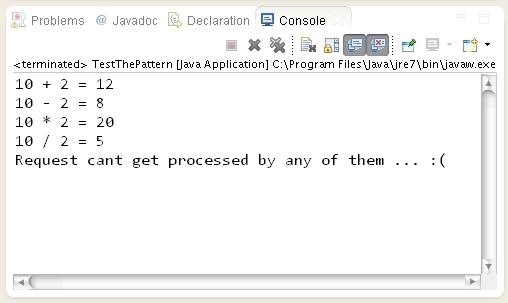 Program to implement Chain Of Responsibility Design Pattern in Java using simple example. // between them based on some internal communication. // it to next Handler in the chain. // on them will be performed. // to nextHandler in chain as provided by setter above. // Subtraction handler if it can't process it. // Multiply handler if it can't process it. // Division handler if it can't process it.